WELLINGTON, Fla. – April 19, 2017 – Finalists were determined Wednesday for the 2017 U.S. Open Polo Championship at the International Polo Club Palm Beach (IPC). In the semifinals defending champion Orchard Hill took a 10-9-overtime victory over previously undefeated Flexjet, and 2015 U.S. Open winner Valiente defeated Travieso (a team that made their U.S. Open debut this year) 16-6. 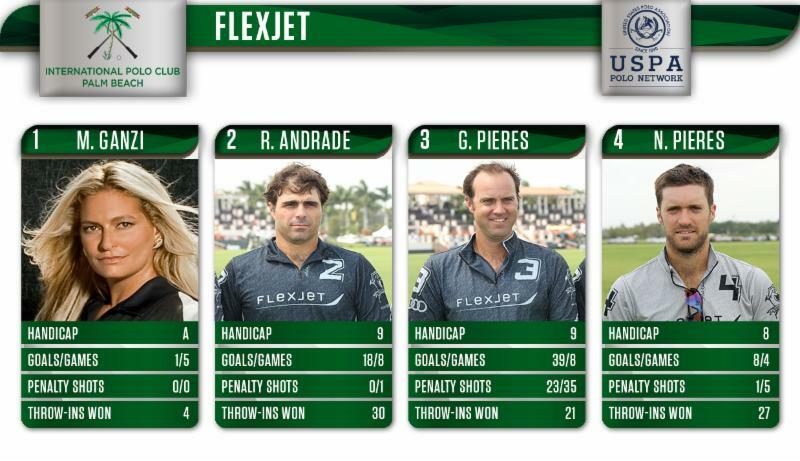 The first match of the day featured Flexjet (Melissa Ganzi, Rodrigo Andrade, Gonzalito Pieres, Nico Pieres) against Orchard Hill (Polito Pieres, Juan Chavanne, Facundo Pieres, Steve Van Andel). Flexjet demonstrated why they came into the game undefeated as they outshot Orchard Hill 5 shots to 1 to begin the game. Flexjet took an early 3-0 lead behind back-to-back goals from Nico Pieres, along with a goal from Rodrigo Andrade. 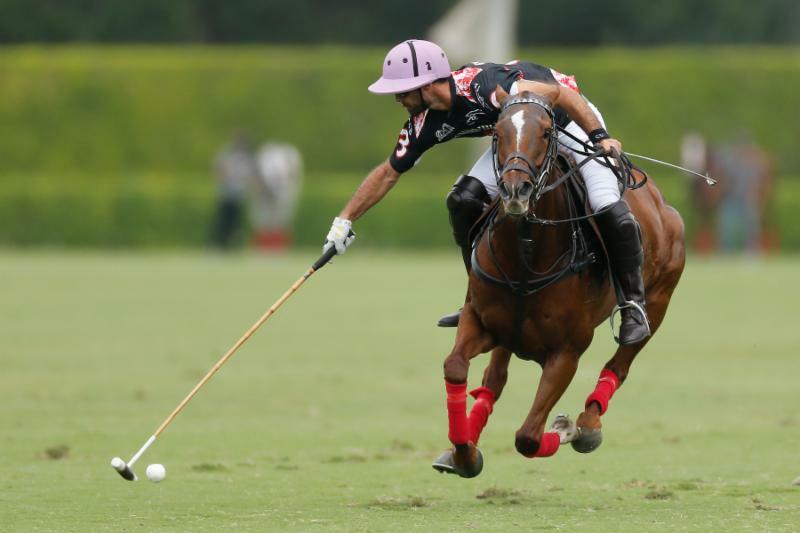 Flexjet controlled play through the first two chukkers, holding Orchard Hill to a single shot and only fouling twice (with neither foul providing Facundo Pieres with a penalty opportunity). The combination of defense without fouling gave Flexjet the edge as the game unrolled. The trio of Nico Pieres, Gonzalito Pieres and Rodrigo Andrade played an effective game defensively, with two players always in the action and the other covering the back. 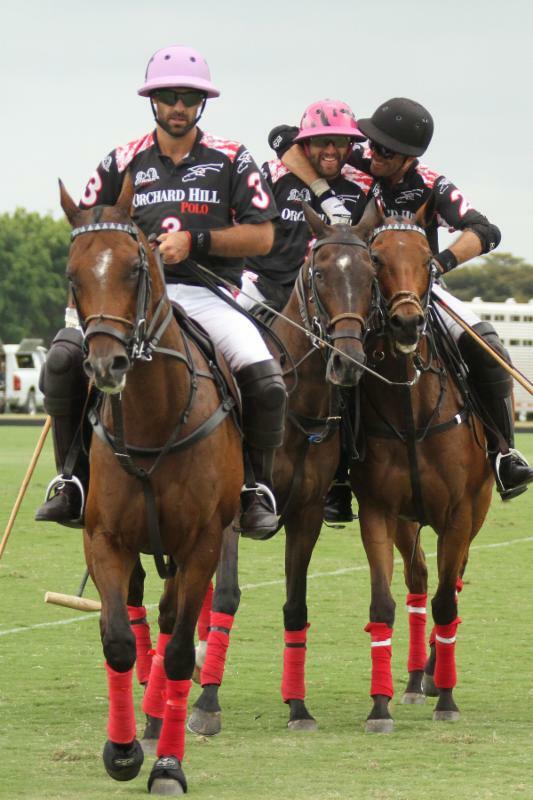 That seemed to puzzle an Orchard Hill team that used the duo of Facundo and Polito Pieres to generate their offense. Orchard Hill started to come alive in the third chukker, shooting at goal four times while holding Flexjet without a shot. 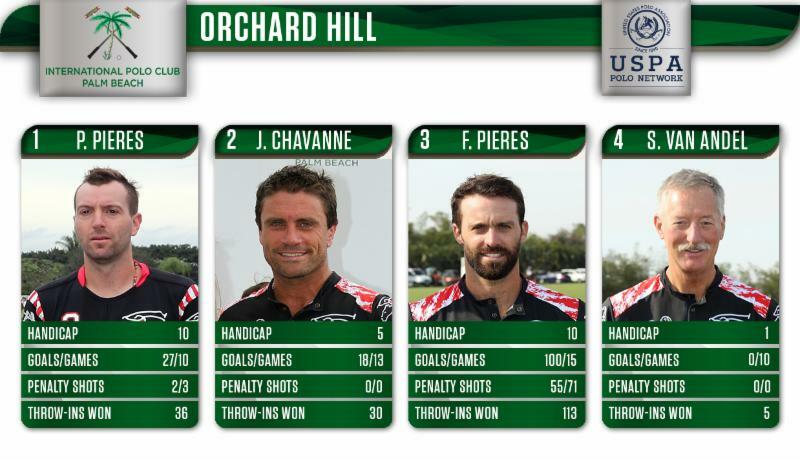 However, Orchard Hill was only able to convert 1 of those 4 shot attempts as Facundo Pieres scored his first goal of the game to get his team back within one. A penalty conversion for Gonzalito Pieres pushed Flexjet’s lead back up to two heading into halftime in a low-scoring, back-and-forth affair. Orchard Hill celebrates the win. The close game continued in the fourth chukker as Flexjet continued to keep Facundo Pieres off the penalty line—all the while holding him without a single attempt. They traded one field goal each with Polito Pieres scoring his first and Gonzalito Pieres scoring his second of the game. The fifth chukker was full of excitement from the first throw as Facundo Pieres scored back-to-back goals from the field, while also converting his first penalty attempt to give Orchard Hill their first lead of the day at 6-5. After Andrade tied the game back up at 6, Nico Pieres would drive downfield with time expiring and put the ball through the goal just as the horn sounded to end the fifth chukker. That gave Flexjet a one-goal lead heading into the sixth chukker. The game tightened up in the sixth with both teams committing 3 fouls each, allowing Facundo to convert both of his penalty attempts. That gave Orchard Hill a two-goal lead with 2 minutes remaining. However, a penalty 5 near center for Flexjet resulted in Andrade’s third goal of the game. With less than a minute left, Flexjet won the throw-in and picked up a foul, sending Gonzalito to the penalty 2 line where he would convert to send the game into overtime. 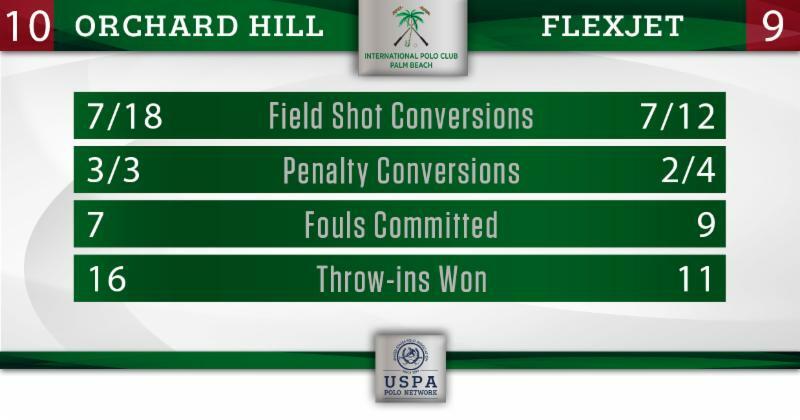 Orchard Hill had more opportunities throughout the game but were only shooting 38% from the field, compared to Flexjet’s 58%. An extended overtime saw exciting runs and a foul by Orchard Hill, giving Flexjet a penalty 4 opportunity to send their team to the finals. Unfortunately for them, the penalty 4 wasn’t converted as overtime went on. On the next throw-in Facundo Pieres won the ball in the front of the line-up, approximately 200 yards from goal. He used superior horsepower to run downfield and finish off the run with a final tap for his game-leading eighth goal of the day—and his 100th goal of the season—to send Orchard Hill to the U.S. Open Finals to defend their 2016 title.